Yah! Another Pinterest find! 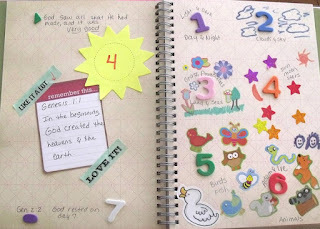 I am doing this with my granddaughter during the day while we study the Bible. She just turned 3, so we are studying the basics. Also, you will find Washi tape. It is great to print and glue these! You get a nice assortment of 'tape' (that is what is on the corners of the scripture), and you don't have to spend about $3-$4 per roll!! You will find most in the above link, but there are some free clipart designs here that will work. 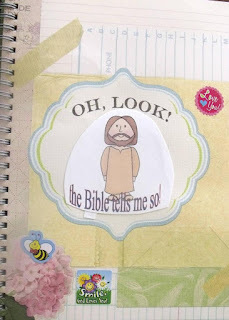 After thinking about this journal, I also added Bible Verse Printables to Pinterest for ideas and you can find the board here. 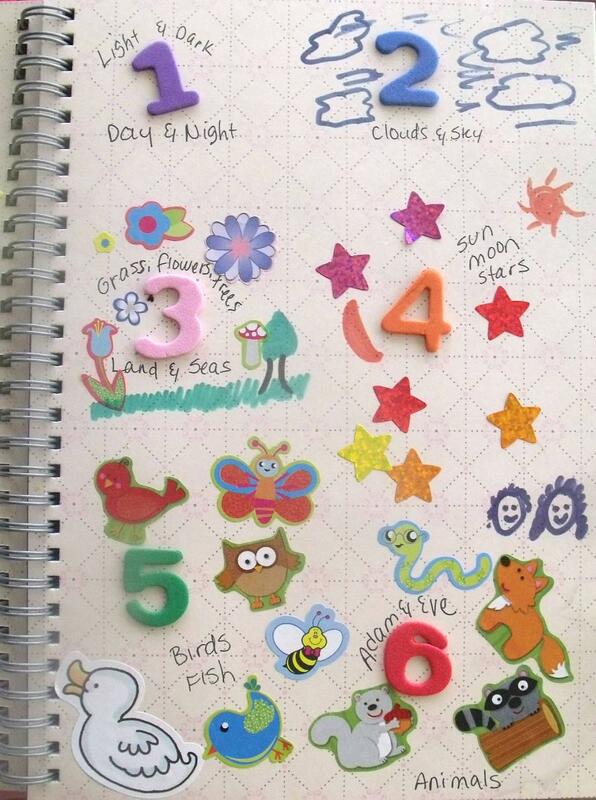 We will use a lot of stickers, the numbers were foamy numbers (these are from Hobby Lobby). I print everything on cardstock. 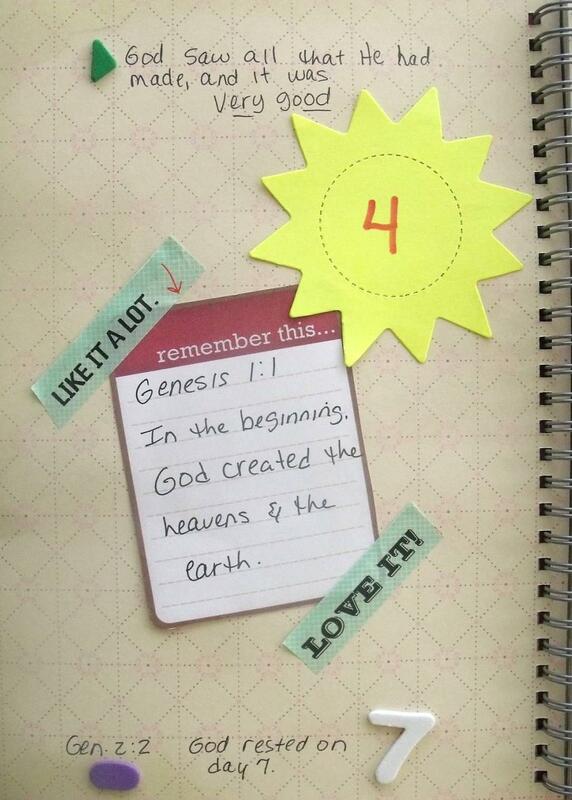 She glued the Bible verse to the page, then added the tape. For the journal, I used the red Smashbook, only because I already had it and didn't have to wait! (I tore out the 2 pages with the dice.) But, if I was going to purchase one just for this, I would look at them all to see what is appropriate. 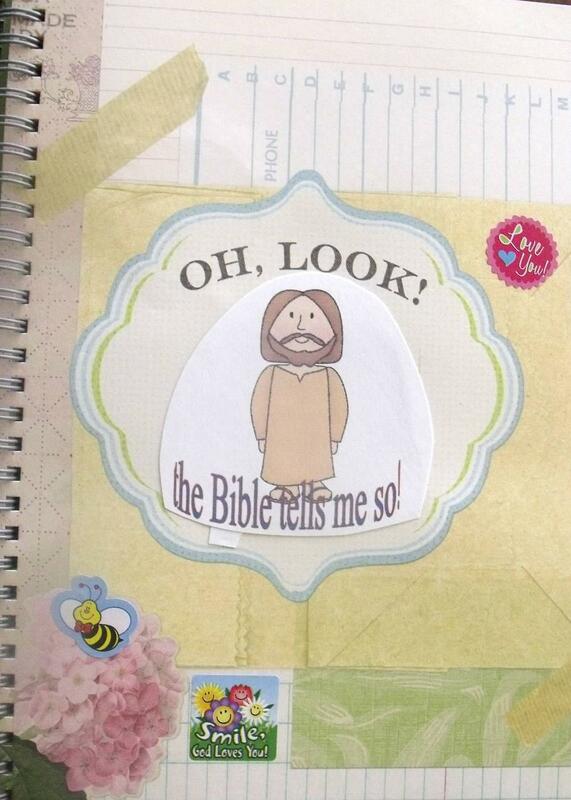 Also, the tape you see on the Bible verse is also for the Smash book by K & Co. You can buy Smashbook items at Archivers (scrapbook store), Michael's, Joann's, etc. This is what I did to change the front cover. 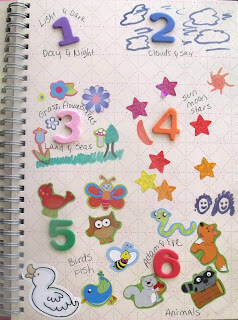 We will be adding more stickers as we work on the book. Left and right side of In the beginning... closeups. Along with our NKJV Bible, we used this book and sang the creation song while she...we did the stickers on the right side. She was having fun matching up her Goldfish with the fish in the book! What a great idea, I am following you now. Thank you. So glad to have this list!